4.83 points at 12 votes (rank 787). Jessica is a cute blonde and lives in an American city named Metro City. That the crime rate in this town is many times higher than the one of New York and even a small stroll to get some cigarettes is only possible with a well-equipped small army, does normally not need to disturb the young woman. She is well-sheltered and protected, because her father is the mayor, Mike Haggar. This former professional wrestler has made his business to clean up the gangster city and thus took on the crime world of Metro City both politically and concerning the election campaign strategy effectively. An urgently necessary undertaking, after all, the town has been named in several magazines and newspapers as "Criminal City" for some time. The local underworld now consists to a great part of members of the Mad Gear Gang. This syndicate could stem from a classical end time movie and unfortunately the boys have already some complete districts under their control. Unfortunately, the Mad Gear Gang has made it to kidnap the beautiful Jessica. Mayor Haggar receives a video message including demand from the kidnapper. The gigantic father prefers negotiating with the fist before words and so he sets out together with Cody Travers, the future son-in-law and his mate Guy, to beat up the evil boys. Coincidentally his two combatants are a Martial Arts expert and a Ninjutsu professional. The trio does not take any weapons with them in trust of their own abilities. As Mike, Cody and Guy prefer to slap through the town (literally) instead of simply going by car, the aim is to arrive alive in the Mad Gear Gang headquarters and then severly wrap Mr. Belger's, the upper boss', wrist there. This way, the daughter is freed and the evil gang is busted. 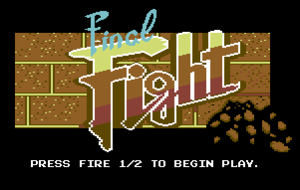 Final Fight is a vertically scrolling beat 'em up in the style of Double Dragon or the console game Streets of Rage. 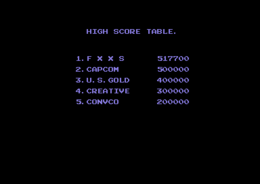 The arcade game was converted for numerous systems, the differences between the systems are partially considerable. 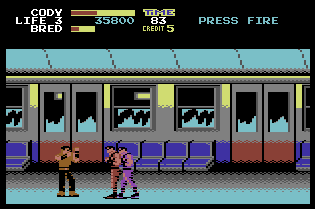 In the version for the C64, the two-player mode was done and all characters known from the original appear. The bonus levels were also taken over. This was partially not the case with the other versions. 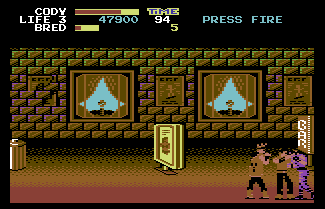 In return, C64 players needed to lower their sights concerning the game graphics, especially concerning the sprites. The background graphics on the other hand make rather successful impression. Small side elements, e.g. the flame traps or the wheelchair of the upper boss were deleted. In the cassette version the intro was completely taken over. The outro is shortened, the "slushy scene" with Cody and Jessica in the park is missing. Unfortunately, the sound effects were reduced to a minimum of undefinable sounds. The sound programmer, Dave Lowe, who has actually a good reputation, clearly delivered one of his worst pieces here. 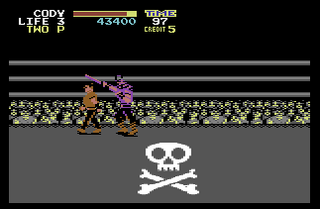 The worst are the game controls, in comparison to the original the second fire button was deleted, which reduced the choice of fighting techniques significantly. Above all the collision query defies description, two meters off are liberally counted as a hit. Collectable weapon sprites are partially shown with a white background, which is a downright dilletantish graphics bug. Due to technical reasons it is of course on the C64 not possible to display a bigger amount of enemies at the same time. The arcade original has amongst others a special attraction, because in some situations complete troops of enemies are jumping into the screen. 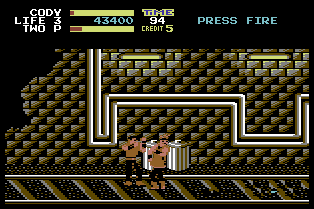 Some enemies even entered the fighting scene coming out of the background graphics, came e.g. through doors, sat on the sits of the metro or at the roadside before they interfered. 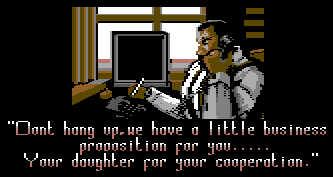 These scenes were hardly or if, then only poorly, converted for the C64. Knife: Especially Cody can handle knives and daggers superbly. Katana: Quick, sharp and deadly, these swords are always a good choice. Iron pipe: Exactly the right thing to reduce aggressive feelings! Jessica Haggar shares the fate of many female video game characters of the early 1990s, she was kidnapped by the top villain. But her Mario is named Cody. Cody Trevors is Jessica's boyfriend. He is expert in Mixed Martial Arts and a trained knife fighter. 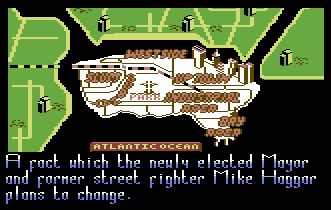 Mike Haggar, for his part mayor of Metro City and also a former wrestler and accordingly the strongest in the team. Guy, Cody's best friend standing with them helpfully. He is a masterly Ninjutsu fighter and the fastest of the three heroes. The Mad Gear Gang has a great number of members. Some are trained in handling knives or swords, others are especially tough or strong. The biggest part of the gang are some wimps, that have no speciality. It is also important to have cannon fodder. The members of the gang with more or less fighting power are named Bill Bull, Bred, Dug, El Gado, G. Oriber, Holly Wood, J, Jake, Poison and Roxy, Simons, Two P. and Wong Who. Furthermore there are Axl and Slash, who even appear together here. The gang's boss and his seven followers have significantly more to go for on the battlefield. At the end of each round you need to take on one of them. Boss: Damnd, a Street-Gang-Boss throwing with knives. Boss: Sodom, he combines wrestling and sword fighting. Here you need to scrap a car as quickly as possible. Boss: Edi E., a donut-eating, fat, corrupt cop. He also uses his gun recklessly. Boss: Rolento, another follower of the super villain Mr. Belger. When crossing a factory, all glass panes should get smashed as quickly as possible. Boss: Abigail, is one of the last obstacles that needs to be removed. Top boss: Horace Belger, the head of the Mad Gear Gang, is getting a bit long in the tooth, but he is a skilled shooter with his crossbow. On the dusty streets stay on the path leading you over a hidden ladder to the underground storage room of the Mad Gear Gang. In the storage room defeat all resistance. 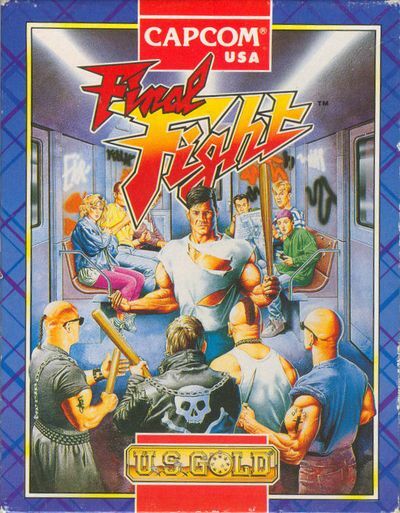 Fight along the platform until the train arrives. Be careful, as during your travel you will be attacked several times. The train will stop between two stations. Jump off and fight your way over the rail tracks through the dark tunnel. You fight in a ring deep under the earth against the champion while hundreds of excited members of Mad Gears are shouting. For this you need endurance to succeed. When you have defeated the champion, you will get bonus points by smashing the parked car at the gas station within a certain time. Attack the enemy on the street in front of the restaurant and fight your way through the bar. Fight your way down the street until you meet a corrupt policeman. He will shoot at you. Now your special techniques are needed to eliminate the cop. You have to fight against "Mad Gears" again while passing a bridge in an industrial area. When reaching the lift at the construction site you need to compete against a troop of ninjas that throw grenades. You get bonus points by smashing all the glass windows in a factory within a certain time. You get closer to freeing Jessica when fighting along the skyline. Some of the cracked versions of the game have common trainer functions as level skip, unlimited energy, lives and suchlike. To use Haggar's sepcial techniques, stand in front of the enemy, pull the joystick into the direction of the enemy, then press the fire button quickly repeatedly until Haggar has grabbed him and jumps with him. Bonus items, points, medicine etc. can also hide in items as hydrants, dustbins etc. that can be smashed. Shmendric: "It is really pathetic! 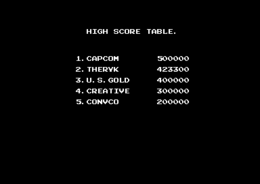 Capcom releases first class beat 'em ups and the C64 conversions of them are all first class failures. 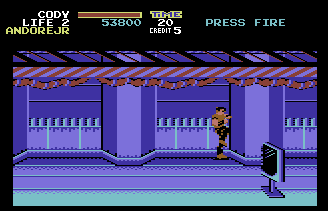 Again a totally loveless conversion that cannot be compared to a Double Dragon. Playing through it once in the two-player mode can well be accounted for, but to do more of it to yourself is more painful than all blows and hits that Final Fight has to offer. 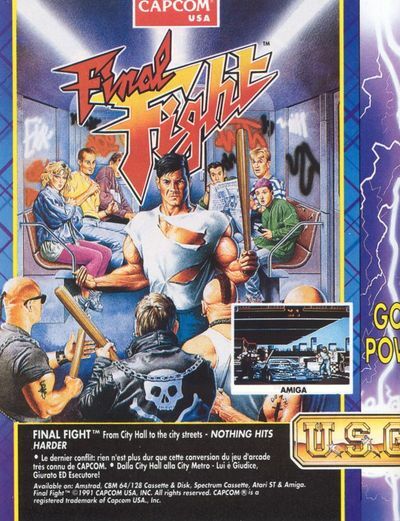 The original of Final Fight was one of my favourite arcade games." H.T.W: "I do not think that badly about this work. 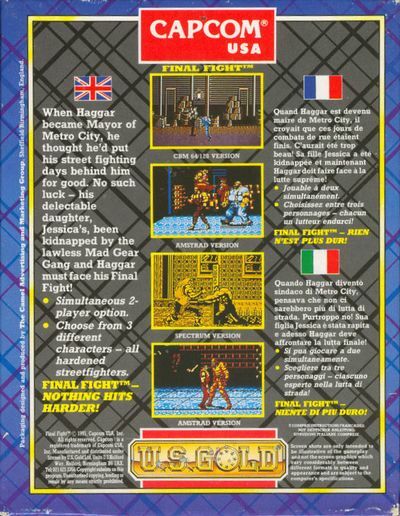 Surely, the background graphics could be finer, the movements of the sprites seem a bit unskillful, the topic of the music takes care of itself, the highscore list is not saved and also there are too little hit variations and special moves available. But you have to partially smirk, because there are also funny scenes, as e.g. the car owner that runs towards his heap of metal while crying, when you have ended the "car smashing bonus round" with "perfect". At least there is also still an intro and an end sequence. TheRyk: "Laaame! 99% of the game you need one single move to defeat harmless dorks while looking at background gfx that seem pretty nice initially but soon all look pretty much the same. Add poor animation and useless weapons and you've got all a good BeatEm Up does NOT need. Dead boring waste of time, 2 points." 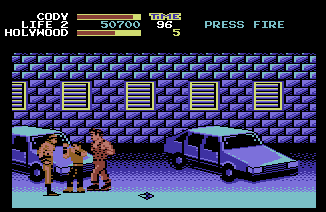 The bonus level in which you need to smash a car, is almost identical to the one in the game Street Fighter II. But there it fell victim to the cutbacks. The two Capcom games share one universe, both were continued several times. In the later parts, there are cameo appearances of the characters. 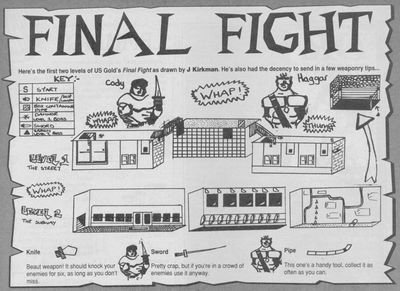 Final Fight was originally developed under the name Street Fighter '89, but it was renamed as it differed too much from the original. There are different rumours and information about the female members of the Mad Gear Gang, Roxy and Poison, concerning the gender. It was often said, that they are two drag queens. The origin of this claim is supposed to lie in a Capcom speaker who was allegedly approached in an interview that it is not admissible to strike at women. Hereupon he is said to having answered sarcastically, that the two are in truth two dressed up men. Roxy and Poison were swapped against two characters named Sid and Billy in the Super NES versions outside Japan. This is also valid for the identical Wii version. Already the arcade machines in the Japanese and the international (English) version differed slightly. Originally, Jessica was shown in the intro in underclothing, for the prudish America she then put on her dress (see M.A.M.E. 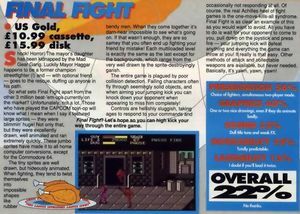 screenshot below). 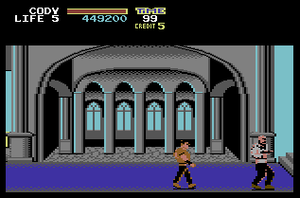 In the C64 version they oriented themselves on the original. ... and the censored Jessica. The Martial Arts movie with the same name by Jet Li from 1986 has no relation to the game. This page was last modified on 2 March 2017, at 22:26.